Much of the following information comes from "British Columbia: Pictorial and Biographical", Volume 1. 1914. "Lewis Bonson was born in Peebleshire, Scotland, on the Tweed River, May 10th , 1831. He was the son of Henry and Marion Bonson, both of whom were representatives of old Scots families, the father having been for many years in the employ of Sir Thomas Gibson Carmichael, owner of Castle Craig. Bonson aquired his education in the public schools of Kirkurd and at the age of 15 entered upon a period of apprenticeship to the joiner's and wheelwrights' trade. Having completed it, he went to Edinburgh, where he worked as a joiner until 1851, when he went to London, remaining in that city for 3 years . In 1854, he joined the Royal Sappers and Miners at Woolwich. After a short time spent at Chatham, he was sent, in 1855 to the seat of the Crimean War, serving until peace was declared. He received the British and Turkish Campaign medals for his service. In 1856, he was transferred to the garrison at Gibralter for 5 months. At the end of that time he returned to England and 2 months later was detailed for special service in Central America. Returning in 1858, he spent 3 months in England and on the 12th of July, Bonson was united in marriage to Miss Jemima Urquhart, a native of Cromarty, Ross-shire, Scotland. This marriage would eventually produce 6 children: Marion, Robert, Henry (who passed away), Charles, James, and Nellie. Bonson volunteered for service in British Columbia. Bonson was the senior NCO in Captain Parsons' detachment which went by way of the isthmus of Panama and up the Pacific coast. As a Serjeant, Bonson's Regimental Pay would have been per Diem 2s. 10 1/2d. plus Working Pay per Diem 3s. to 5s. Mrs. Bonson and the children traveled with the main body of the Detachment, which reached British Columbia on the 12th April, 1859. The Men set to work on building Barracks and Married Quarters. The Bonson's appear to have their own small home just behind the Colonel's house. New Westminster, circa 1862, the green box shows the location of the Bonson home. It is possible that the proximity of the Bonson's to the Moody's explains how Mrs. Moody came to hire Mrs. Bonson as her cook.
" ...Our Kitchen is off the house, so that we are not annoyed with the heat of the Stove in the small rooms, but it has its advantages, we had all our fires lighted so that "indoors" we were very comfortable." When the mosquitoes arrived at Queenborough, Mrs. Moody and her children fled to escape them in Victoria. It appears that Mrs. Bonson remained in the Camp. A few months later the Moody family returns to the Camp. By October, the Moody's are in their new, larger house (as per the image above). "...We and the Grant's are the only people in the Colony who have any Servants - and we both give our Cooks 40 Pounds a year!!! "We just had a visit from the Judge, Mr. Begbie, about ten days ago. We invited him to dinner, and I must really tell you what a very good one we had, in order that you may see that in "roughing it in the Bush" is not such very hard work - carrot Soup, Fish cakes, Leg Mutton, Beef Steak Pie, Curry and cutlets, Ducks, Maccaroni and Cheese, Pudding and Trifle, Apples, Biscuits, Ale, Porter, Sherry and Port (from Edinburgh). " "Mrs. Spalding has no female Servant, so we must all do our best. The "nursing" is going on very well. I have a good appetite and my "Treasure of a Cook" makes delicious "slops"." "...I suppose by this time you must have heard of Baby's birth and how well I was, and how good the Children were, and how comfortably Mrs. Bonson managed all the household for me. What am I to do without her? I never go near the Kitchen, never know what's for lunch or dinner, nor even what is in the house." But, regardless of Mrs. Moody's desire to have Mrs. Bonson remain in the House, things are about to change as Mrs. Bonson finds herself pregnant once again. "I have not yet met with a Cook, and Mrs. Bonson leaves me in a fortnight. "We shall always have 2 Soldier Servants, so we can never be as badly off as that. I am going to try to get one who can do some Cooking, but after Mrs. Bonson grease and dirt will be very miserable. "Walter (Moody's son) still confines himself to grunting, he comes in with a long story, which perhaps you discover means, "I have been to Mrs. Bonson and she gave me some water, and bread and milk"." "...Mrs. Bonson, my Cook, left me a fortnight ago, and now I have a Corporal of Sappers in her place..."
"I have just heard that our late Cook, Mrs. Bonson, has a fine little girl." "...Mrs. Howse, the Soldier's Wife, still talks of going to England with us. It will be such a comfort if she does and I am sure she would remain with me a few days till I got a Nurse. I think she and her husband may come and live with us this Winter. She would do the washing in the house, and help in any other little ways. She would always look after Baby for me when I was out, he, of course, would merely live and have his meals with the others, as Sergeant Bonson did. It is not quite arranged yet but I think it will answer. They are both most respectable people. She is the only woman in the Detachment who goes regularly to Church twice every Sunday." Bonson received an honourable discharge in 1863 and retired to private life, turning his attentions to contracting and building at New Westminster. According to Frances Woodward, Bonson received Crown Grant, April 29 1870, for Lot 47, Group 2, New Westminster District. Mr and Mrs Lewis Francis Bonson, New Westminster, 1870. Mr Bonson, founder of the family in British Columbia was a Royal Engineer, 1858. 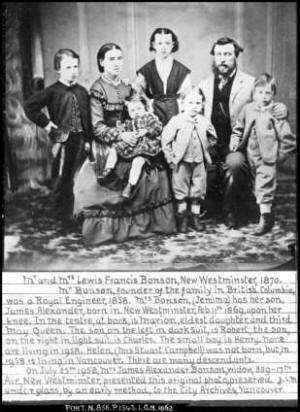 Mrs Bonson (Jemima) has her son, James Alexander, born in New Westminster, Feb. 11th 1869, upon her knee. In the centre, at back, is Marion, eldest daughter and third May Queen. The son on the left, in dark suit, is Robert; the son on the right, in light suit, is Charles. The small boy is Henry. None are living in 1958. Helen (Mrs. Stuart Campbell) was not born but in 1958 is living in Vancouver. There are many descendants. On July 25th, 1958, Mrs James Alexander Bonson, widow, 359-17th Ave. New Westminster, presented this original photo, preserved J.S.M. under glass, by an early method, to the City Archives, Vancouver. In 1871, Bonson buys "The London Arms" in New Westminster. He took great interest in the advancement and growth of the community and did able work of reform and improvement during his period of service as road superintendent for the provincial government, a capacity in which he acted from 1876 to 1880. He afterwards engaged for a short time in the liquor business but disposed of this in 1892 and purchased a farm of 370 acres at Keatsey, nine miles from New Westminster. He continued to improve and develop this property along modern lines for a number of years, finally disposing of it in 1905, when he retired and returned to New Westminster. In 1909, he participated the RE Reunion. Bonson was a conservative in his political beliefs, and his religious views are in accord with the doctrines of the Presbyterian church. He was well known and widely beloved in the community, where his venerable age, combined with his many sterling qualities of mind and character, endeared him to all with whom he came in contact."